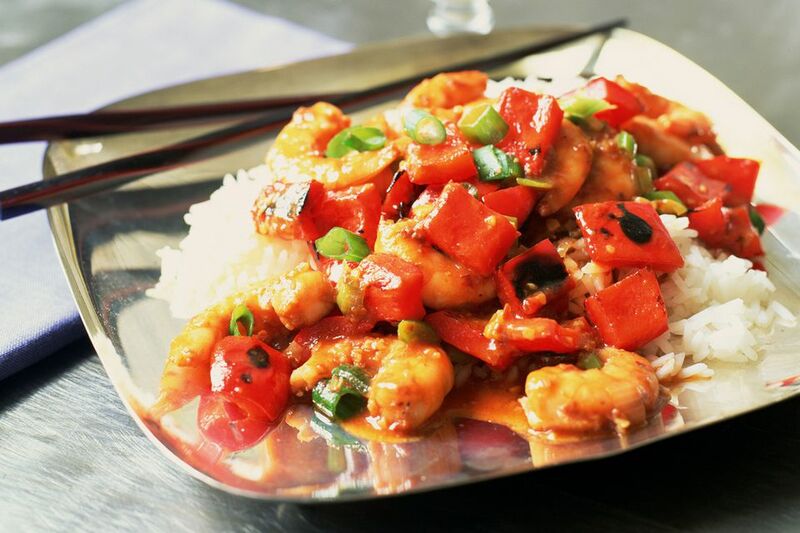 Sweet & sour shrimp is a family favorite at our house, plus it's easy to make because you don't have to bread and fry the shrimp first and believe me, the taste is so good, you won't miss the breading one bit (plus it's naturally low-fat!). Thai sweet and sour dishes are nearly the same as their Chinese counterparts, except for the use of fish sauce and more spice, both of which add a deeper dimension to the flavor. Most restaurants color their sweet & sour dishes to get that deep red hue, but I find it's just as pretty made with cayenne pepper for both spice and coloring (it ends up more orange than red, which is fine with me). Hope you enjoy this recipe as much as my family does! Pour one can of pineapple chunks (with juice) into a medium-size pot. Drain the juice from the other can into the pot, squeezing out all the juice from the fruit (you can save it for eating or other dishes). Add the vinegar, sugar, fish sauce, cayenne, lemon or lime juice, and ketchup. Bring to a boil, then reduce heat to medium or until you get a nice strong simmer. Simmer 12-15 minutes, uncovered, or until sauce reduces by one-third. Remove from heat and set aside. Place a large frying pan or wok over medium-high heat. Drizzle in the oil and add garlic and onion. Stir-fry 30 seconds, then add the vegetables. Stir-fry 2-3 minutes, adding 1-2 Tbsp. of the sweet & sour sauce as you fry, just enough to keep ingredients sizzling. Add the shrimp plus soy sauce and continue stir-frying until shrimp turn pink on the outside (1 minute). Add remaining sauce. Stir and bring to a gentle simmer for 1 minute, then reduce heat to medium-low. In a cup, stir cornstarch into​ the water with a fork until dissolved. Add this to the stir-fry, stirring slowly. When your stir-fry has thickened enough for your liking (about 1 minute), remove from heat. Do a taste-test, looking for a balance of sweet and sour, plus a hint of spicy and salty flavors. If too sour, add more sugar; if too sweet or too salty, add more lemon/lime juice. More cayenne can be added for more spice. If you'd like a deeper color, add a few drops red food coloring (optional). Top with toasted sesame seeds, if desired, then serve with Thai rice and enjoy! Sesame Seeds and How to Toast Them: There are different types of sesame seeds, but we usually only see the white kind at regular supermarkets. Black sesame seeds can be found at Asian/Chinese food stores and are even better for you than the white variety. The easiest way to toast sesame seeds of any color is to place a Tbsp. or two of sesame seeds in a dry frying pan over medium-high heat. Stir continuously until seeds have toasted (light golden brown). Other Vegetables You Can Add: green pepper, mushrooms, Chinese cabbage or regular cabbage, baby corn.